One of the most impressive examples is the Asakusa region of Tokyo, where I stayed. 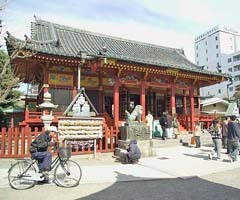 In the heart of Asakusa is the eponymous Asakusa Shrine and the Senso-ji Temple, two of the oldest religious sites in Japan. Founded in 628, Senso-ji is a large Buddhist temple that was beautifully reconstructed after being nearly destroyed during World War II. It’s a very impressive sight, as the builders kept most of its original style. Stepping into one section of the temple, I saw many old, priceless Buddhist statues, and I paid my respects by tossing in a one hundred yen donation. I am fascinated by Buddhist iconography and temples, so I’m always overcome by a sense of deep reverence and awe when I see a place like Senso-ji, a temple that still stands after so many centuries, surviving even the destructive forces of war. There were many stalls along one of the paths on the temple grounds, each selling a variety of things. I saw many traditional gifts, models, and clothes, as well as some very inviting snacks, like takoyaki, or fried octopus. I could have spent hours browsing, but I knew I had a full day ahead of me, so I moved on. Near one of the entrances to the temple grounds, I saw yet another ancient Japanese site: the Kaminarimon, or Thunder Gate. 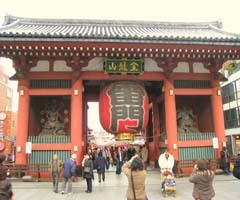 First built in 942, then reconstructed in 1649, it acts as the gateway to Senso-ji. Within the gate itself are massive statues of Fujin and Raijin, the Shinto gods of wind and thunder, and two Buddhist deities, Tenryu and Kinryu. They stand as guardians to the temple and are amazing to behold up close. Asakusa Shrine was, sadly, under construction during my visit, covered up by a large curtain, but I’m told that it is equally impressive. 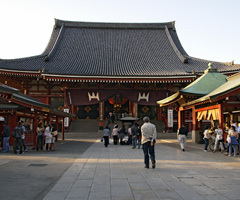 The shrine is dedicated to the founders of Senso-ji, and it was founded in 1649. It’s really something else to see an ancient site like this still standing in the middle of Tokyo, the biggest and most advanced metropolitan area in the whole country. It serves as a reminder that, at one time, Tokyo was Edo, one of the centers of feudal Japan’s rich history. On my next report, I’ll detail a trip to Akita, the northernmost prefecture of Japan, full of snow, rice fields, and a few surprises.